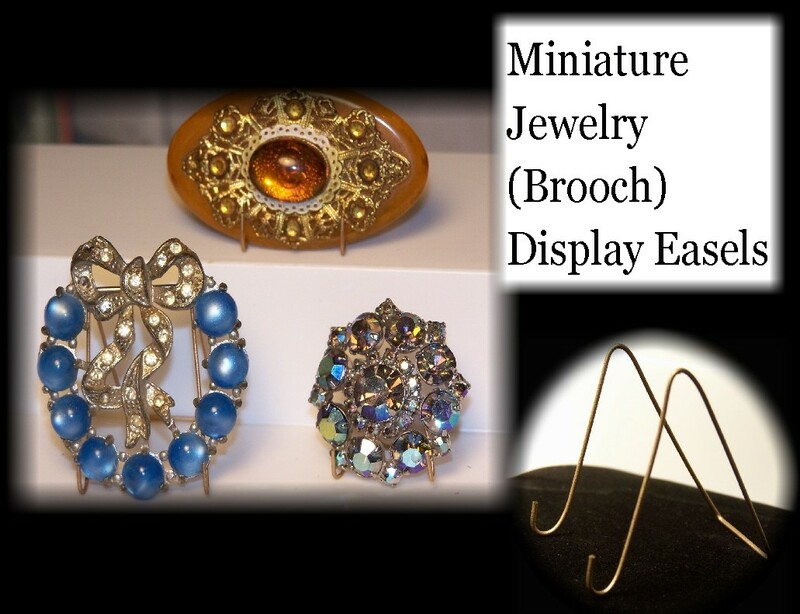 A slightly lager size, measuring just over an inch tall, is available for displaying jewelry and ephemera, such as on postcards, matchbooks and photographs. I bet they’d work for displaying pinbacks too. 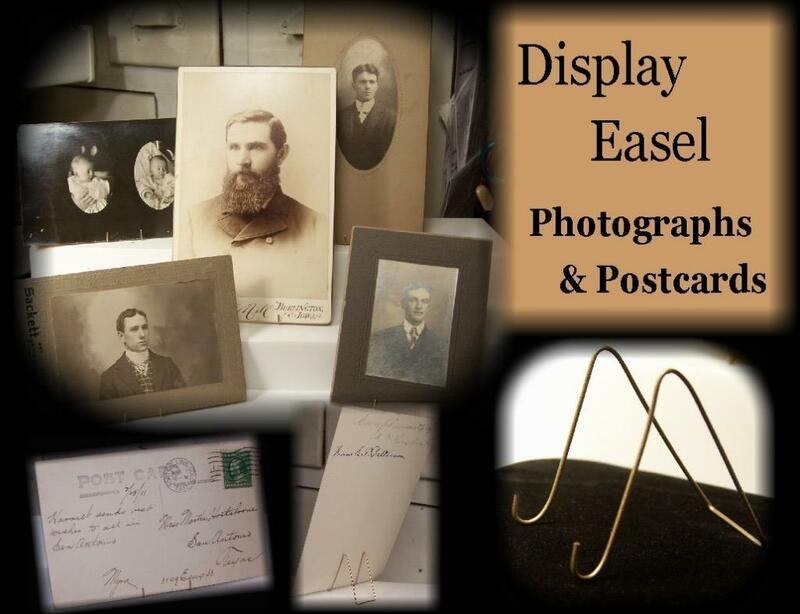 Both sizes of the little collectible display easels are sold in lots of one dozen — bur larger order amounts and custom sizes are welcome. If you collect vintage fashions, you tend to end up with a lot of heartbreakers — not only items which won’t fit, but garments which are in such poor shape, all you can do is salvage pieces of fabric, buttons and other trims. And if you collect vintage sewing items and notions, you typically end up with a lot of vintage buttons too. You can certainly collect buttons. But if you’re looking for another way to enjoy them, get creative! 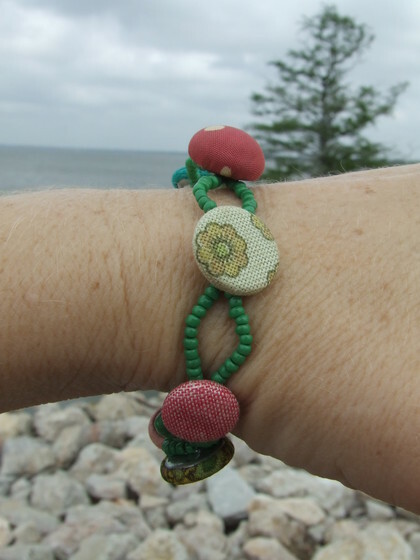 Dream Merchants II has taken old fabric-covered buttons and combined them with beads to make a one of a kind bracelet! 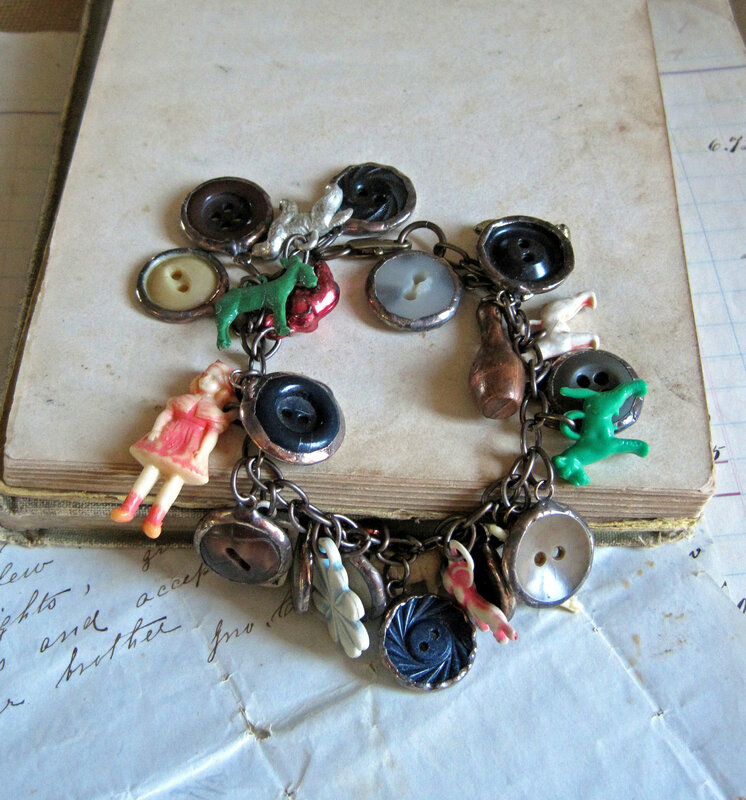 ThatOldBlueHouse2 takes old buttons and adds them to charm bracelets for extra charm, color and texture. Vintage buttons can even be given the spotlight and be placed in settings, like the jewels they are. This green one is from 2fillesdunord. At CountryCoveCreations, old buttons are used to create pins or brooches — like this colorful mod one where the retro buttons are layered on a retro plastic belt buckle. All great ideas to preserve something from vintage fashions, a special occasion dress, or even a favorite shirt that no longer fits. Posted on February 14, 2012 Author DeannaCategories Crafts, FashionTags antiques, buttons, charms, collectibles, collecting, crafting, hobbies, how to, jewelry, vintage, womenLeave a comment on Button, Button, Who’s Got The Button? 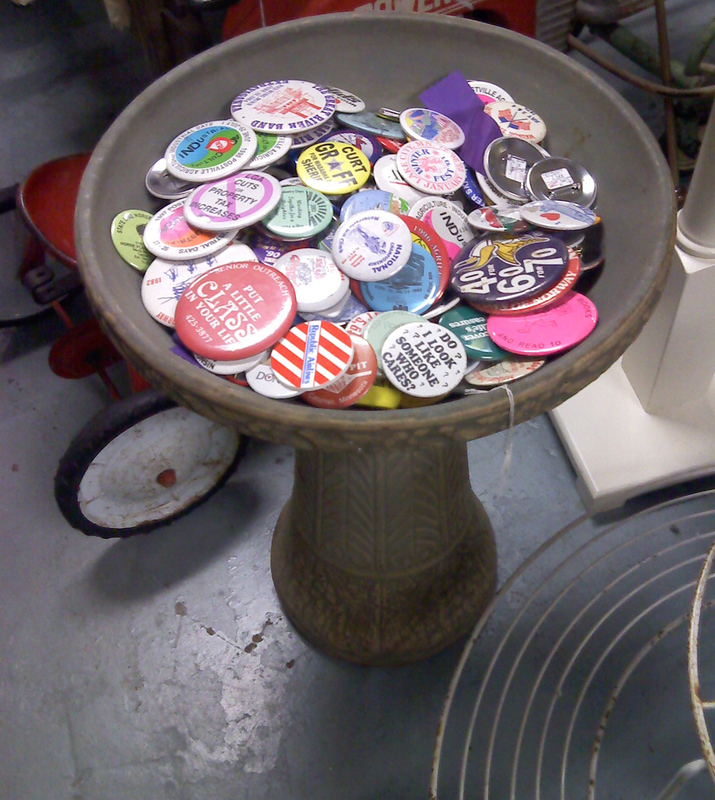 I spotted this clever display idea at a local antique mall: the dealer has put a selection of collectible pinbacks in a birdbath. At home, of course, this might present a dusting problem (always the bane of collectors! ), but if you used a sturdy cement birdbath, you could place a large round piece of glass or Plexiglass over the top. Like the kind used to make those round boudoir tables. The clear covers would keep dust, pet hair and other contaminants out (and, if UV protective, damaging sunlight too) while still allowing the collection of vintage lithos, celluloid, and metal pinbacks to be on display. This would work well for housing and displaying vintage and antique buttons and other small bits and bobs too. Imagine it as an end table, next to your sofa or chair, with a little vintage lamp on top, lighting the contents, inviting guests to look inside. A very charming conversation piece! 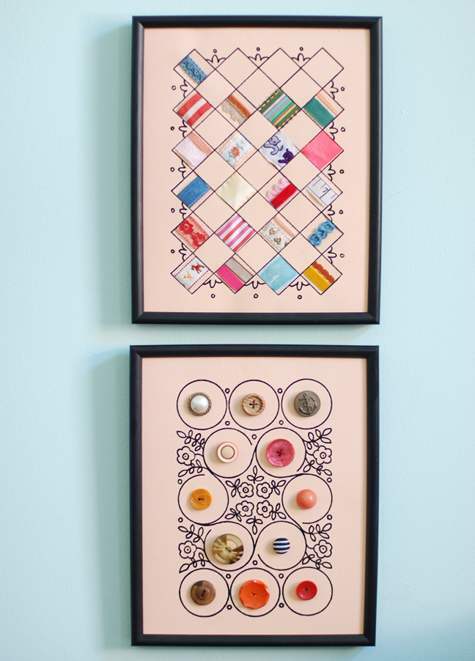 At Design Sponge, Haylie Waring shows us how to make sewing notions displays. Waring’s examples use ribbons and buttons, but this project could also be done with beads, lace, fabric swatches, etc. — as well as jewelry, shoe clips, pinbacks, and other bits and bobs. Due to the lack of space in my studio, I am constantly forgetting what notions I have packed away in my organizer containers that I keep hidden in a storage closet, or up on my highest shelf. When you don’t know what is in those containers, it is hard to know where to begin, and I am often tempted to just go out and buy more supplies. This DIY project is the solution to that problem, and it seconds as art work on my work-space walls. …Also, I like to tag each board with a number that will match up with the storage container where you keep your coordinating back-stock, so things are easily located. Included in the step-by-step project instructions are two of her original 8×10 design templates. My Grandmother had a button box. She would add any buttons from clothes that were worn out and being cut up to use for patches and cleaning rags. Sometimes she bought sets of 4, 6 or more buttons on sale somewhere and brought those back (kept on their cardboard packaging) and put them in the button box too. As she got older she became legally blind and was no longer able to sew her own buttons (or anything else) as well as she used to. She was always more of a cook anyway. I still remember the white sweater I fixed for her. It had a few loose buttons and one missing. It was one of the very few times I got to look through something of my Grandmothers. She brought out the button box and let me have a look through them all. I found enough new buttons for the white sweater, all matching and all pink. For years she would brag about how well I sewed those buttons on her sweater. She said I had done them so well they would never come off. I did too. I remember sewing them on and how honoured I was to do something, something real, for my Grandmother. Not just kid stuff playing around. She kept that sweater and the buttons did last years and years. I still like buttons. I guess I have a soft spot for them. My Mother had a button box. My Grandmother’s buttons became part of that collection in time. My Mother gave me the button box a few years ago, when she started spending winters in Florida. We used to sew together but that was usually around the holidays. Now that I’m alone I still do some baking but not so much sewing. It’s kind of sad. I have that button box but it’s been many years since I last looked at any of the buttons in it. There are some nice crafts with buttons, like button bouquets. I’ve seen a few uses for them other than the traditional clothing fasteners. One site has old/ vintage buttons turned into fancy rings. I’ve seen scrapbookers use buttons as flower centres in drawings. We have used buttons in place of game pieces. They string up on ribbon and look pretty girlie and pretty too.